If you've been wishing and hoping and thinking and praying for an even more convenient way to feast on Taco Bell from the comfort of your couch, today is a very good day. Because as of this morning, Taco Bell is now available for delivery nationwide via Grubhub. Our condolences to your beach bod diet. Taco Bell and Grubhub's partnership, which was first revealed last year, has officially come to bear fruit for T-Bell fiends all across the country per an official announcement on Thursday that the restaurant chain is officially delivering nationwide. The news is welcome for many folks who've been waiting for a chance to fully embrace their inner couch potato selves and score some Gorditas and Crunchwrap Supremes without leaving the house. While delivery has been available previously via DoorDash and Grubhub in select markets, this marks the first time it's actually up for grabs for people everywhere in the US where Grubhub offers Taco Bell delivery. To celebrate the big news, Taco Bell is also offering free delivery on all Taco Bell orders over $12 (excluding tax) for a limited time. The big delivery rollout also comes with improved delivery times, according to a press release. “Our approach to delivery is a recipe for success all around, not only benefiting our customers but also our team members, franchisees and Grubhub drivers, by streamlining how orders hit our kitchens and when they are picked up,” said Julie Felss Masino, president of Taco Bell North America. To get in on the action, you can either either head to TacoBell.com plug in your zip code to order via Grubhub or order directly from the Grubhub website or app. 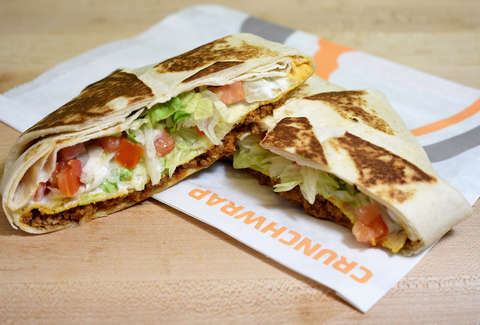 Seems now's a better time than any to get your hands on a Double Cheesy Gordita Crunch before they disappear again.